Being asked for advice can be an affirming experience, but actually giving advice can sometimes entail risk. How can this happen, and what choices do we have? The ruins of the Temple of Apollo at Delphi, home of the famous Oracle. Ancient Greek people would visit Pythia, oracle and priestess to Apollo at Delphi, who provided counsel and predictions that were regarded as messages directly from the gods. Oracular statements were sometimes direct, sometimes inscrutable. 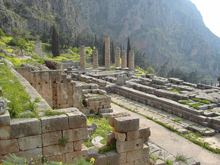 Browse a collection of statements from the Delphic oracle. Photo taken in April 2005, by and courtesy of Napoleon Vier. Sometimes, when people seek advice, they actually want something else. It can be almost anything — someone to listen, someone to show concern, someone to test the seeker's ideas. And sometimes, there is peril for the adviser, because instead of an adviser, the seeker wants someone to take responsibility for the seeker's own decision. Here's a typical scenario. Let's call the seeker Sam and the supposed "adviser" Amy. Sam describes the situation, and Amy takes in what Sam says. But as with all communications, what Sam says isn't necessarily accurate or complete. It might be abbreviated, or it might be slanted (intentionally or not), or it might be very seriously distorted. And what Amy receives and how she interprets it might not match exactly what Sam sent. Next, Amy conjures up some advice that might or might not fit the situation. And Sam receives it, interpreting it imperfectly. The chances of this process working well are good, if both Sam and Amy are open and honest with each other and themselves, and if they both devote the needed time and energy. In most cases, sadly, the necessary honesty, openness, and devotion are not supplied. Most advice, especially that given en route to somewhere or in the midst of other things, isn't likely to work. And when it doesn't work, the advice-seeker sometimes charges the advice-giver with having given bad advice. When the seeker isn't able or willing to devote time, energy, and honesty to the advice process, what can you do? Declining directly to give advice, or deferring with I-can't-right-now-but-call-me-later, can lead to trouble in the relationship. Here are four possible alternatives. When your knowledge of the situation is incomplete, taking any position at all can be difficult to justify. Give a response of the form on-the-one-hand-on-the-other-hand, taking no position. Make the seeker's own responsibility clear. For instance: "It's hard to say, because I know I'm not in your shoes, but tell me what you would do if X happened?" difficult to justifyabout your own experience, emphasizing that it's only about your own experience: "I have no idea if this will work for you, but here's what happened to me one time." When you have no special expertise about the issue, make that clear: "I'm not really a good one to ask about that, but have you talked to Michael?" If the relationship can support it, directly declining to advise is probably best: "I wonder, is it possible that you're really looking for someone else to take responsibility for what is, after all, your decision?" Would you like to see your comments posted here? rbrenxLgZNyXyiMZYafGPner@ChactBhIUIcUkFIDDjVfoCanyon.comSend me your comments by email, or by Web form. I offer email and telephone coaching at both corporate and individual rates. Contact Rick for details at rbrenrMuFTEtlpitYpgPSner@ChactBwVTwolCVmUzUYLoCanyon.com or (650) 787-6475, or toll-free in the continental US at (866) 378-5470.